As if Taco Bell wasn’t already the ultimate in romance, the fast-food chain recently announced that couples will have the opportunity to get married at its flagship Las Vegas Cantina location. Yes, folks, the same minds that brought you the beefy five-layer burrito will now have all creative control over your wedding day. What could go wrong? Believe it or not, there is a wedding chapel at the flagship restaurant where Taco Bell will give couples the supreme (see what I did there?) treatment. And, as if that spread isn’t romantic enough on its own, the happy couple will also receive a Taco 12 Pack for their reception dinner — so no need to check the “chicken” or “fish” box on the RSVP. The entire wedding package comes at a grand(e) total of $600. But don’t send out those save-the-dates just yet: The Cantina Chapel doesn’t open for business until summer 2017. However, if you’re desperate to launch a bouquet of fire sauce at all your single friends, you can enter the aptly named Love and Tacos Sweepstakes for a chance to be the first couple to experience the nacho-filled nuptials — with some extra perks thrown in. Yeah, like you needed any more convincing. Cheers to the happy couple! I wish you nothing but happiness and a home full of chalupas. 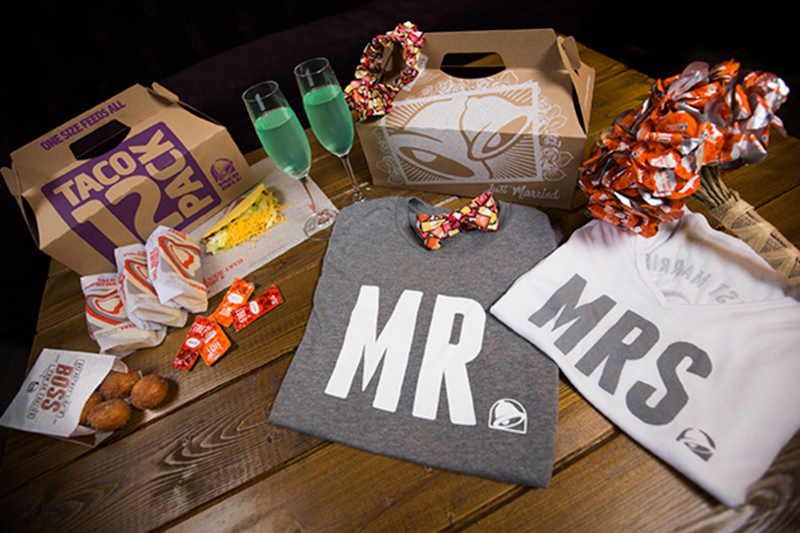 Your Turn: Would you get married at Taco Bell? Grace Schweizer is a junior writer at The Penny Hoarder. TBH, she’d marry a beefy five-layer burrito if it asked her.